as an extra high Eurobanker 42 clears a notorious humpback bridge. CLICK this picture for story and pictures. 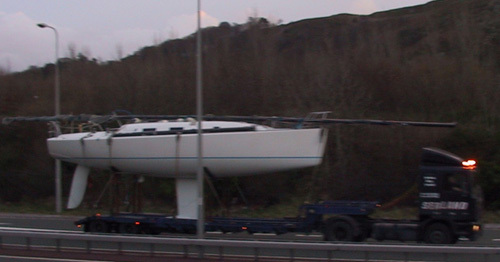 After hauling an extra high Eurobanker 42 motor yacht 2500km from the Mediterranean to the Irish Sea, with her keel no more than 30cm off the road, Transboat driver Gary Cooke took command on the flying bridge of the yacht HAMAR when she cleared two notorious humpback bridges on the last mile across the marshes. CLICK this picture for Great Escape story and pictures. 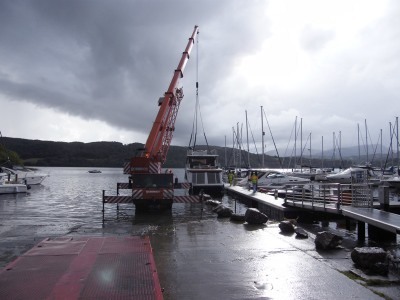 September 2008 Boat owner Derek Abbott, trapped on Windermere for a year without a berth for his 14.6m - 48ft - houseboat SWALLOW, pulled off a Great Escape. 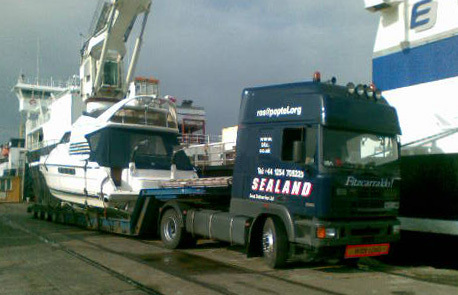 This Fairline Targa 40 motor yacht was purchased in North Wales GB, transported by lorry to Grimsby, cradled on the quay and hoisted aboard the Eimskip ship STORFOSS, outward bound for Murmansk. 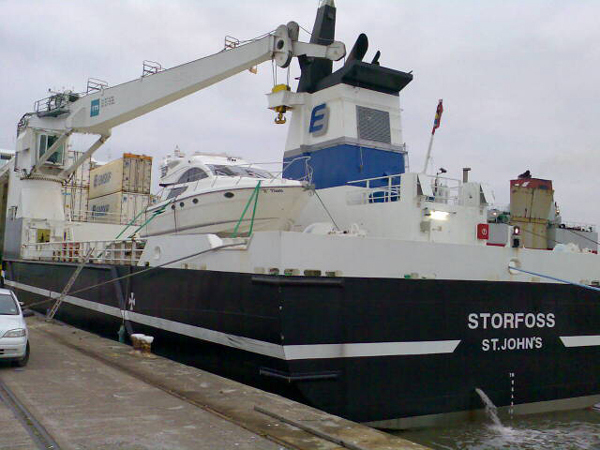 The crew of STORFOSS launched the Fairline in a Norwegian fjord near her new owner's home at Ålesund. 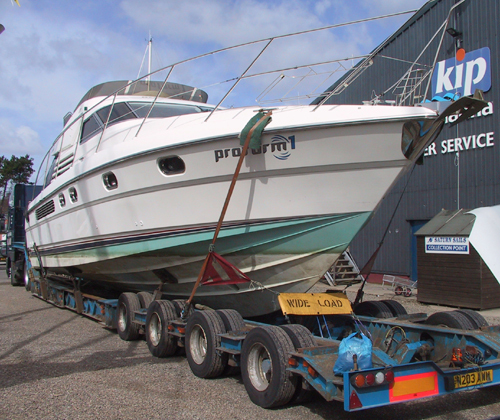 In April 2008 the 14 tonne 13.72m Fairline Squadron 43 PROFORM 1 was shipped from Inverkip in Scotland and launched in Western Norway from the STORFOSS. Cradling by Sealand Boat Deliveries. 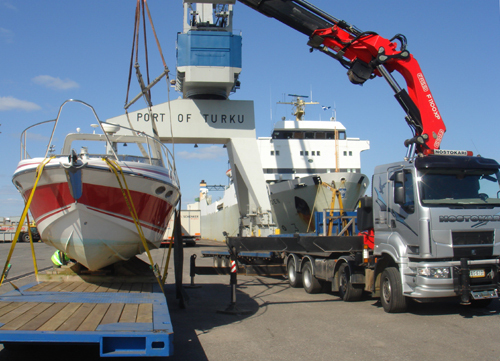 The Sunseeker Portofino 31 SIMPLY RED left Pwllheli, North Wales, on May 7, 2008, and was afloat in her new home port of Naantali in Finland before the end of the month. 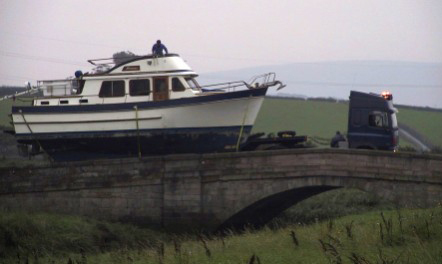 In May 2008 Rice Transport of Dungannon were called in by Sealand Boat Deliveries to move this 60ft x 13ft [18.2m x 3.96m] 39 tonne new steel wideboat, built by Carefree Cruising in Czechia, delivered by road and ferry for launching on the Grand Canal at Sallins, Co Kildare IRL. 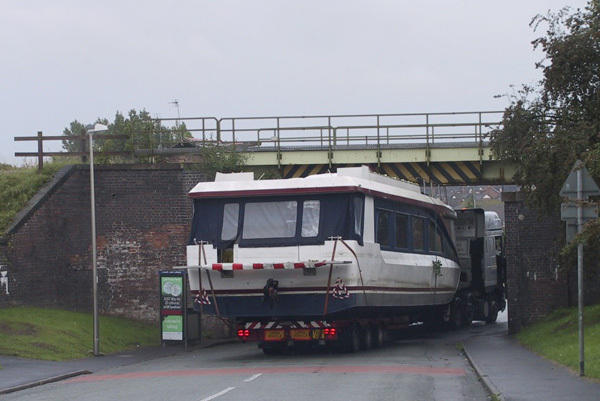 Barge owner Jim Hart used different multi-modal transport methods on the shakedown cruise of his 40ft x 10ft [12.9m x 3.04m] 13 tonne steel wideboat. 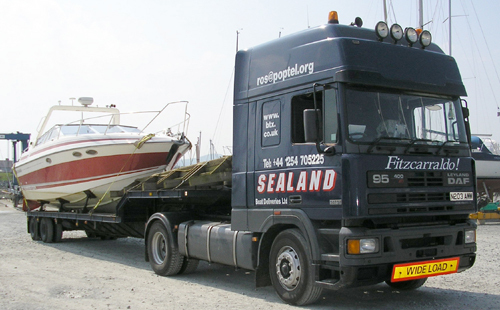 Planning to cruise in the Low Countries, he asked Sealand Boat Deliveries to collect the new HILDA JANE from the workshops of Liverpool Boats and ship her aboard an Atlantic Container Line RORO ship loading in the Royal Seaforth Dock, Liverpool, bound for the container terminal in Antwerp, at the heart of the European waterway system. Two days later, HILDA JANE rolled out of the MV ATLANTIC CONCERT for launching on the River Scheldt by permanent terminal crane. 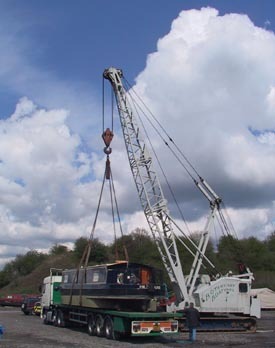 Jim's plan beat the problem of spot hiring expensive mobile cranes when launching heavy British narrow boats and barges on the canals in Northern France and Belgium. The cost, from workshop to water in Belgium, was GBP 4,000.00, including Value Added Tax and Jim's passenger trip by night ferry to Rotterdam. 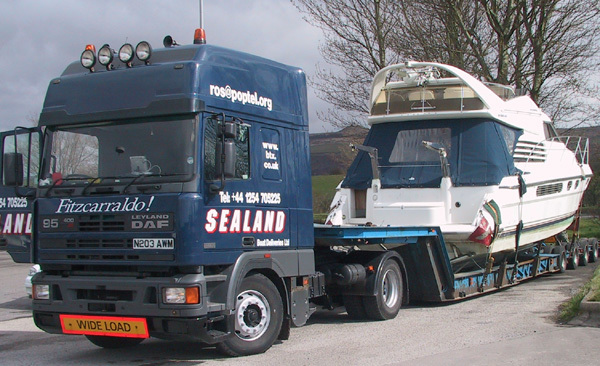 In April 2008, Jim asked Sealand to bring HILDA JANE back to the Leeds and Liverpool Canal from the Biesbosch in the Netherlands, this time by lorry. 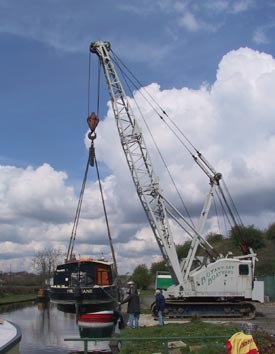 Just 24 hours after loading at the W. Snoek Jachtbetimmering in Drimmelen, HILDA JANE was lowered into the Leeds and Liverpool canal at Botany Bay Boatyard, near Chorley. The cost was almost exactly equal to Jim's outward freight bill. 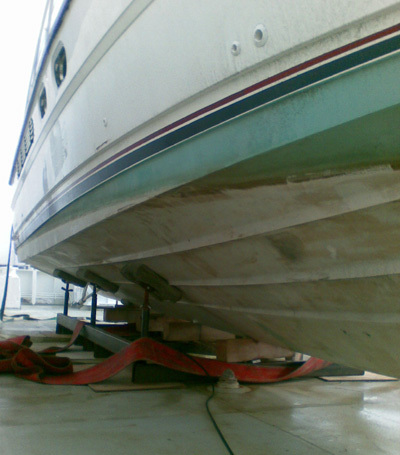 Lock repairs at Liverpool Marina forced many winter road moves. Neil Thomas's fast Prima 38 is here loaded at Liverpool for delivery to Holyhead in time for winter racing at Pwllheli, North Wales. Road tunnel Conwy, North Wales. 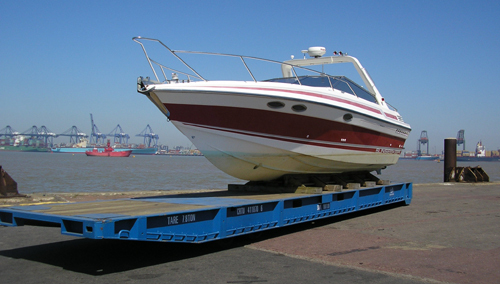 CLICK this picture for boat transport news from 2007.